Talking of Buddhism statue of Heian period, we recall “Jocho style”. Jocho (son of Kojo) had built an era. His remarkable service is establishment of Yosegi method (not carving from one timber, join some wooden parts together). And he had turned it into a style of Japanese tastes. Generally, it’s admired that the hallmark of his works are gently, soft and aristocratic statue. 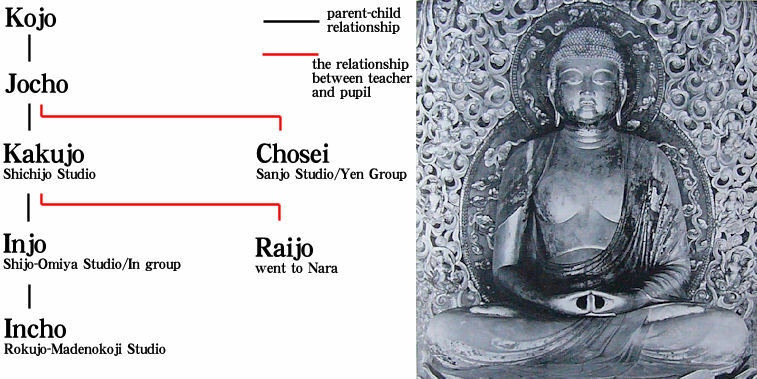 A little come down in time, Chosei who is pupil of Jocho had had his studio at Kyoto Sanjo (called Sanjo Studio), and he had accepted many orders from noble-class. Chosei’s group is called Yen Group (because almost member had the sound of “Yen” to their name). Further, Kakujo who is son of Jocho is key man. He had had his studio at Kyoto Shichijo (called Shichijo Studio), and he worked. His studio had survived than any other studios. Raijo, pupil of Kakujo, went to Nara. It’s guessed that his main work was restoration of statues. Because Nara was not already the capital city and the center of Buddhism was Kyoto. And Injo, son of Kakujo, had had his studio at Kyoto Shichijo-Omiya (called Shichijo-Omiya Studio), and they had produced Jocho style statues. Injo’s group is called In Group (because almost member had the sound of “In” to their name). They also joined hands with noble-class.